What does NSYNC stand for? What does NSYNC mean? This page is about the various possible meanings of the acronym, abbreviation, shorthand or slang term: NSYNC. NSYNC ( or ; sometimes stylized as *NSYNC or 'N Sync) was an American boy band formed in Orlando, Florida in 1995 and launched in Germany by BMG Ariola Munich. NSYNC consisted of Justin Timberlake, JC Chasez, Chris Kirkpatrick, Joey Fatone, and Lance Bass. After heavily publicized legal battles with their former manager Lou Pearlman and former record label Bertelsmann Music Group, the group's third album, No Strings Attached (2000), sold over one million copies in one day and 2.42 million copies in one week, which was a record for over fifteen years. Among the group's singles, "I Want You Back", "Bye Bye Bye", "This I Promise You", "Girlfriend", "Pop" and "It's Gonna Be Me" reached the top 10 in several international charts, with the latter being a US Billboard Hot 100 number one. In addition to a host of Grammy Award nominations, NSYNC has performed at the World Series, the Super Bowl and the Olympic Games, and sang or recorded with Elton John, Stevie Wonder, Michael Jackson, Janet Jackson, Phil Collins, Celine Dion, Aerosmith, Nelly, Left Eye, Mary J. Blige, country music supergroup Alabama, and Gloria Estefan. Although NSYNC announced the start of a "temporary hiatus" in early 2002, the band has not recorded new material since then. In 2007, Lance Bass confirmed that the group had "definitely broken up". The band completed five nationwide concert tours and has sold over 70 million records, becoming the fifth-best-selling boy band in history. Rolling Stone recognized their instant success as one of the Top 25 Teen Idol Breakout Moments of all time. Justin Timberlake went on to become one of the world's best-selling music artists, with more than 32 million albums and 56 million singles sold throughout his solo career. Couldn't find the full form or full meaning of NSYNC? Know what is NSYNC? Got another good explanation for NSYNC? Don't keep it to yourself! "NSYNC." Abbreviations.com. STANDS4 LLC, 2019. Web. 25 Apr. 2019. 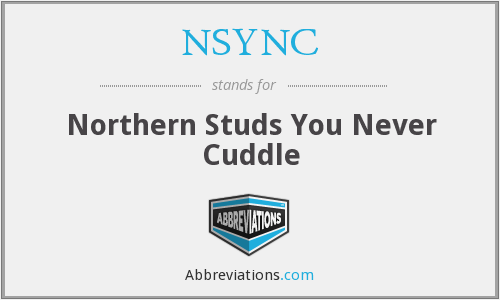 <https://www.abbreviations.com/NSYNC>.